"Getting people to love the piece or hate the piece wasn’t Mountainfilm’s intent with this special artist-in-residence project. Instead, we want people to think about art in public spaces, come up with their own interpretation of the image and engage in a dialogue about issues." Last week, the wall on the west 200 block of Telluride’s main street was a bare expanse of gray concrete. Over the weekend, thanks to artist Chip Thomas and a small brigade of volunteers, it was transformed into a beautiful and bold piece of street art that has drawn onlookers, stirred up conversation, inspired many a social media post and provoked people to think. I had the honor of helping with the installation on Sunday morning, along with other volunteers, like Stash Wislocki, Scott Upshur, JimHurst, Lexi Tuddenham and Kingston Cole. It was my first time doing anything like this, and a couple things struck me: The first was the sheer amount of passersby who stopped to take pictures, gaze for a moment, ask Thomas questions, compliment the work and, occasionally, voice complaints. It was public art in action — art that invites anyone on the street into the conversation, to engage with it. Art that challenges viewers to consider its content. And for us volunteers, it was also an opportunity to get splattered with paint and interact with a remarkable man. Chip Thomas moved to the Navajo reservation in northern Arizona in 1987 to become a full-time doctor. He didn’t expect to stay long, but soon fell in love with the people and stark desert landscapes. 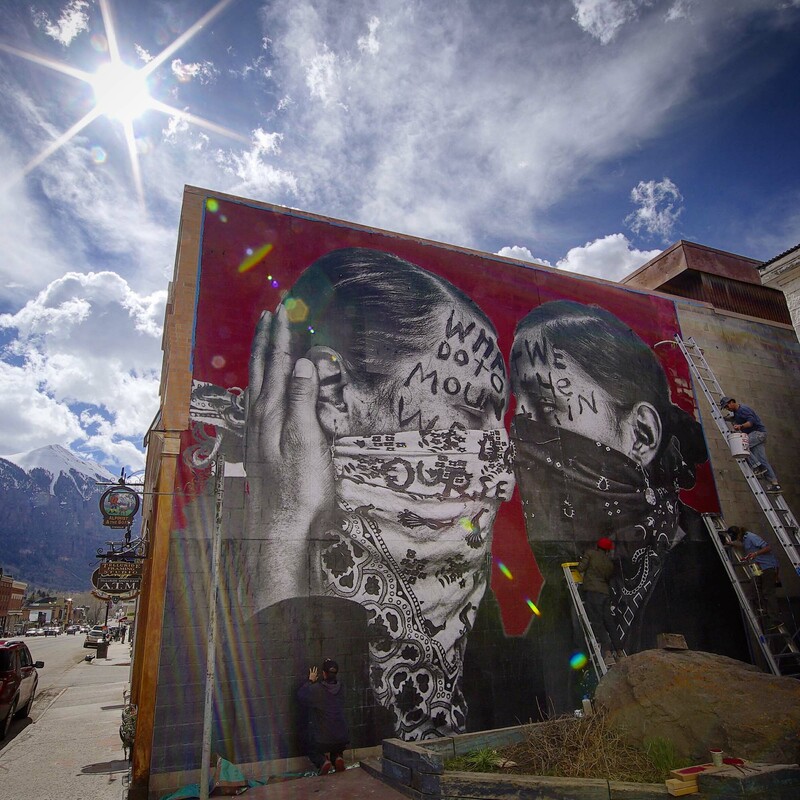 After decades of photographing the community, he was inspired by a Brazilian street artist to move his work outside of galleries and, under the name “jetsonorama,” he began installing images onto water towers, abandoned buildings and fences scattered around the reservation. Since then, he’s made the desert his canvas with beautiful portraits of Native people and activist statements. As word has gotten out about his incredible work, his art has spread beyond Arizona. "I was a tiny part of the end product, but the honor, pride and inspiration it gave me will last much longer than that mural will remain on the wall." Using borrowed ladders, a few buckets of paint and volunteer labor, Thomas orchestrated the weekend installation in Telluride, which entailed painting the wall a rich shade of red before pasting printed paper panels on it and doing detail work. Thomas is gentle, kind and incredibly generous. Not once did I see him roll his eyes or shoo off an inquiring passerby. He told the story behind the piece again and again, never seeming to tire of repeating himself, and was ever patient and calm with his instructions to volunteers. And, we hope, the ephemeral image will only be the beginning of a much longer conversation about art and its relationship to Telluride. Chip Thomas will return to Telluride on May 28 for Telluride Mountainfilm festival. The Telluride Town Council will discuss the mural at its meeting on Tuesday, May 31. Check the Town’s website close to the date for agenda details.